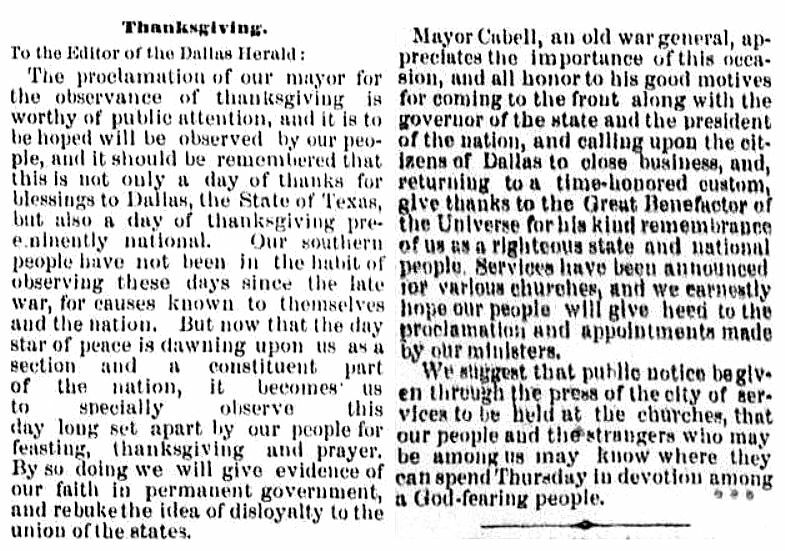 After the Civil War (and even before) many (if not all) Southern states refused to celebrate Thanksgiving, as many felt it was nothing more than a politicized “Yankee abolitionist holiday.” But by 1874, Southerners — and Texans — were finally willing to give it a go. Our southern people have not been in the habit of observing [Thanksgiving] since the late war, for causes known to themselves and the nation. But now […] it becomes us to specially observe this day long set apart by our people for feasting, thanksgiving and prayer. By so doing we will give evidence of our faith in permanent government, and rebuke the idea of disloyalty to the union of the states.